AFTER: The ivory sofa from Boston Interiors is a giveaway that the living room is a refuge for the grown-ups. “It’s the only place in the house where we could get away with such a light color, since the kids don’t really use it,” says designer Dina Holland. The floral painting by Marleen Kleiberg was an Etsy find. 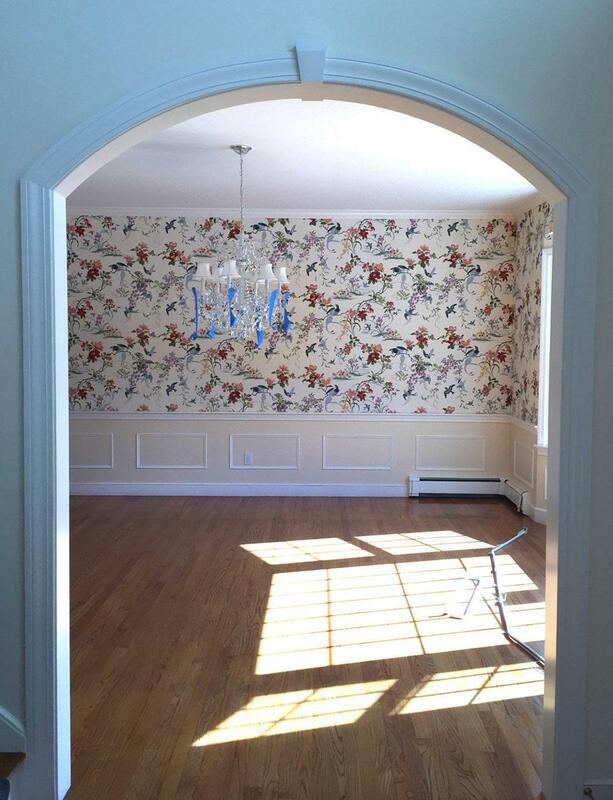 The owners of this Needham home searched for the perfect house for two years. The couple, who have two kids, ages 8 and 10, hoped for a turnkey home with a first-floor guest suite where their aging parents could spend the night. Realizing they would have to undertake renovations to meet their needs, they brought in designer Dina Holland to check out a 1990s five-bedroom in a neighborhood they loved. To introduce a New England sensibility, Holland relied on symmetry and traditional details. The exterior went from haphazard developer dud to picturesque Colonial farmhouse with cosmetic fixes that included removing half-moon windows, building a covered front porch, and punctuating the roof to add a cupola adorned with a whale weathervane. BEFORE: The living room before the remodel project was completed. In the entry, Holland introduced wood wall paneling for a more formal feel. Bright white paint keeps things fresh and welcoming, and contrasts with the refinished floors and wood detailing on the stairs, all stained dark brown. 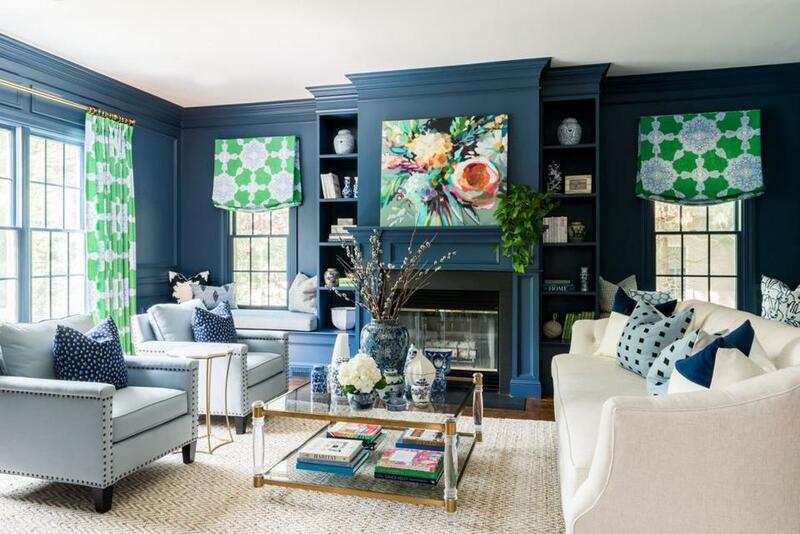 The walls and trim are painted Benjamin Moore Hudson Bay, the designer’s go-to navy. “Nothing says traditional New England more than navy and brass,” says Holland. Window treatments in a fun, preppy pattern — Medallion Paisley from Thibaut — lend shots of Kelly green. Throw pillows in six different prints dot the window seats, armchairs, and sofa, and a glass-topped, brass-trimmed acrylic coffee table, a vintage mirror, and a leafy ceiling fixture in antique gold round out the look. The formal dining room, across the entry, shares the blue-and-green scheme. 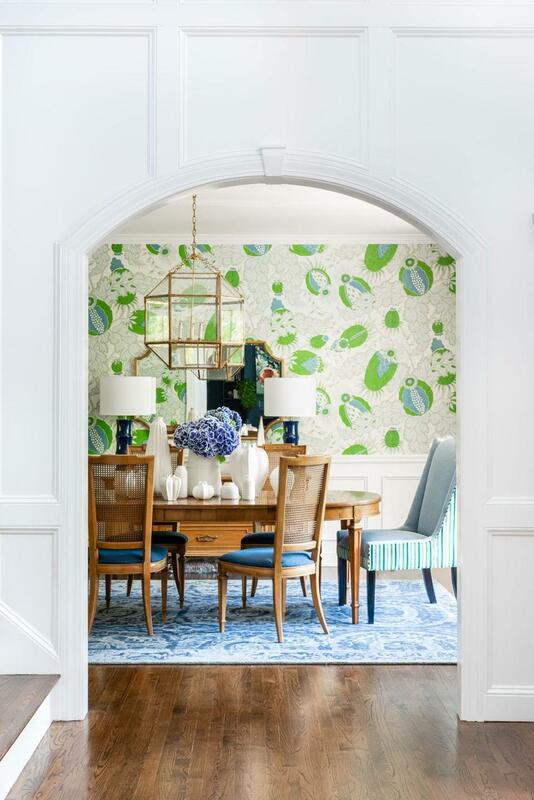 Carnival wallpaper from Christopher Farr Cloth, an oversize leafy print designed in the ’70s, makes a statement, and a medallion-patterned rug in fresh blues grounds the space. The homeowners’ vintage 1950s Thomasville dining set from their last home fit perfectly after a leaf was inserted in the table. Since that left the set two chairs short, Holland had the arms cut off the original two head chairs and chose a pair of new upholstered replacements. The gold-toned accents in this room include a scalloped mirror and giant glass lantern chandelier. “Always go bigger than you think you should with lighting,” Holland says. The family room, a two-story space with tall arched windows, a puny stone fireplace, and a mezzanine open to the second-floor bedrooms, was a deal breaker. If it couldn’t be fixed, the couple wouldn’t buy the house. 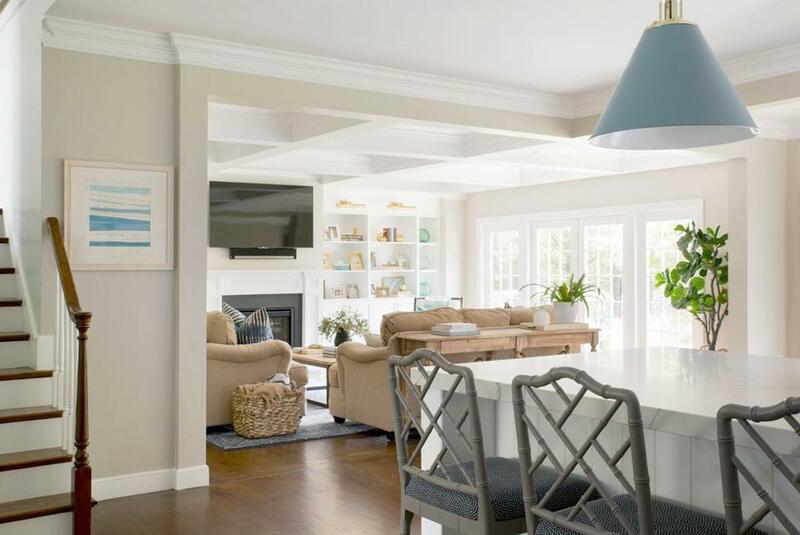 Holland revamped the area by building another room above it — a casual area near the bedrooms called the “pajama lounge.” The family room gained an elegant coffered ceiling and now feels cozy rather than cavernous. In the family room, French doors replace arched windows and a fireplace along the back of the house, and a new gas fireplace and built-in bookshelves line the adjacent wall. The room that had been the den became the must-have grandparent guest suite, with furnishings from the previous master bedroom, and Holland turned the walk-in closet into a full bathroom. The original honed black granite counters line the perimeter of the kitchen; the quartzite top on the island is new. To open up the rest of the first floor, the wall between the family room and kitchen came down, as did a smaller wall with a diner-style window between the kitchen and breakfast nook. White paint and brass hardware freshened up the existing kitchen cabinetry, which gleams against a new marble-tile backsplash. 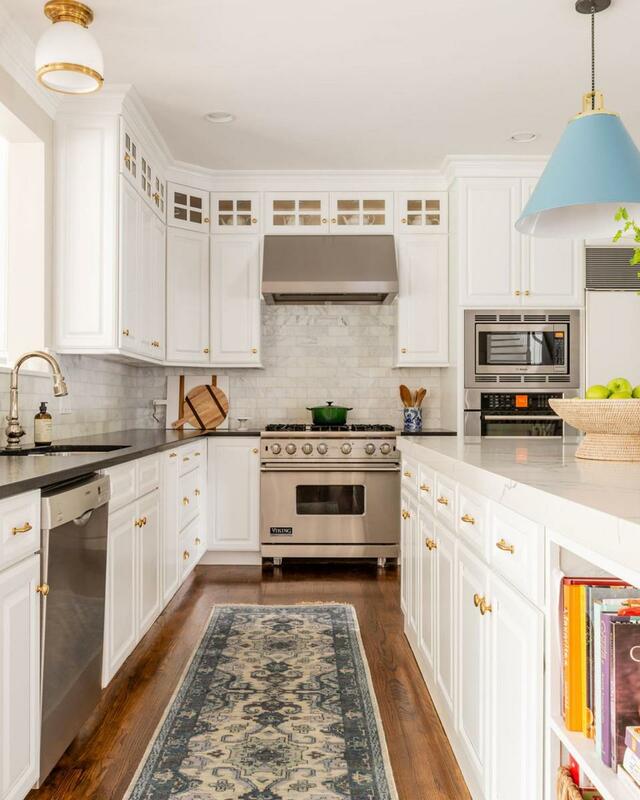 The oddly angled center island became a chunky rectangle with furniture-like detailing and a new quartzite countertop, with a pair of Wedgwood blue cone pendant lights hanging above it. “It’s the color blue that ties the house together,” Holland says. The couple got their coveted mudroom, outfitted with custom built-ins. Holland reconfigured the powder room, relocating the washer and dryer upstairs and dedicating the extra space to a small glass-front pantry. The new upstairs laundry room, created out of a walk-in closet, holds a sink and ample counter space. The kids’ bathrooms were refurbished, too. The master bedroom also got a makeover. Holland moved a window for better balance and created a tray ceiling for interest, utilizing empty space from the unfinished attic. A Capiz-shell chandelier sets the tone for the dreamy retreat, where a tall, curvy headboard with nailhead detailing takes center stage on a textural cable-knit rug. End tables from the couple’s old family room serve as nightstands. Holland used taupe on the walls of the family room for coziness and to differentiate it from the bright white kitchen. BEFORE: The dining room as it looked when the homeowners purchased the house. AFTER: In the dining room, the new color scheme includes the custom upholstery on the head chairs, a striped velvet from Schumacher.